"Polite, courteous, taking the proper steps to protect the pathway area. Completing work in the time which was projected"
By Jean And Tony G.
"The installers Adam and Chuck were very polite and also respectful of our property"
"Bob did an excellent review of our crawl space, made two or three recommendations and spelled what we needed and the overall..."
Bob did an excellent review of our crawl space, made two or three recommendations and spelled what we needed and the overall cost of the project. "I liked that the boss visited the work site...Quality and crew morale stays high when the boss stays in touch." "Troy Miller did a great job!" Troy Miller did a great job! Dear Sir. On July 8, 2015, Mr. Bob Dionise came to our front door and presented the Ayers program. As a result, Larry Salinas came to the house and repaired our sea wall. Mr. Salinas promptly arrived at the appointed time and started preliminary operations on the job. Later, he ordered 10 yards of fill for the holes in our embankment. He moved a big proportion of the fill by hand in the wheelbarrow. He had a pleasant and workmanlinke attitude. Eventually, he had some assistance to complete the job and cleaning up afterwards. We are pleased to have called your company and will certainly recommend you to our neighbors who also have seawalls. Your home is where you retreat with your family; Bob’s goal is to help make it healthier and more comfortable. Bob completed extensive training to design solutions for your waterproofing, foundation, and crawl space repair needs. This includes earning the Certified Waterproofing Professional designation through the Basement Systems International Network of Waterproofing Contractors. He brings a comprehensive, personalized approach to every job. Bob will give you a custom solution based on your goals and exactly what’s going on in your home. Bob’s customers recommend him and the Ayers Team to their family and friends. With a passion for training and mentoring, Bob shares his contagious energy and enthusiasm with his team of System Design Specialists. Bob holds degrees in Electronics Technology and Business Management. He has a diverse technical background as a field service engineer and has worked in the home improvement industry since 2007. German, is a veteran of the U.S. Army, and holds a FCC license to operate high-wattage radio equipment. His favorite leisure activities are woodworking, tennis, and collecting Lionel trains. 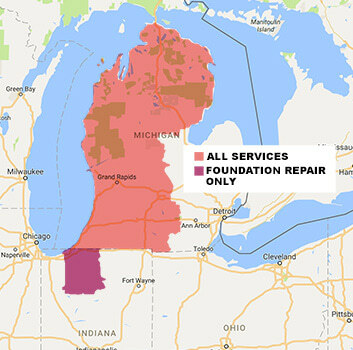 A homeowner from Lansing contacted us referring to her basement that had a weak foundation wall. She did not know how to fix it (but if you want to know more about it click here), so she called us. We drove to her home and installed Wall Anchors. We install these by digging a tiny hole in that are a few feet away from the home. Then we drill a steel rod through a 1-inch hole in the basement wall. After that, the rod connects to an anchor that is placed in the hole of the soil. Once we place the plates on afterward, we have permanently stabilized the basement. So now the homeowner doesn't have to worry about an unsafe basement ever again. WaterGuard is a full perimeter drainage system that captures water and transports it to the sump pump before it can gain access to any of your personal items. Once the topcoat of concrete drys, the basement floor will look as good as new! Mark from Muskegon, MI needed his basement waterproofed. After going out for our free inspection, we decided that the best case of action was to suggest to Mark that we install our WaterGuard Below Floor Drain. As its name states, WaterGuard rests below your floor slab, but on top of the foundation footing. This is important because now that it’s on top of the footing, mud will not get into the drain and clog it, simply because the drain is not sitting in the mud. The WaterGuard also has a drain outlet directly to the sump pump and will not cause any damage to the foundation. Also, since it's installed below the floor slab, you won't even be able to notice that it's there once it's completely installed. There simply isn't an interior waterproofing system that is more efficient and longer lasting than our WaterGuard system, so if your basement is in need of some waterproofing, pick up the phone and give Ayers a call! We have probably all seen ugly sump pumps that just look like holes in the basement, just like the picture on the left, but that is not how its supposed to be, sump pumps should be clean, like the one on the right. We took this Traverse City sump pump and replaced it something that is loads better, the SuperSump. The SuperSump contains a pump stand (prevents clogging of any debris in the sump liner), pump alarm (for when the basement floods), and an airtight sump lid with a floor drain in it (helps water to go down but not air to come up). This homeowner should never have to worry about water problems in her basement ever again.